If the garage door of your Bowling Green, Kentucky, home is outdated, in poor condition, or simply fails to reflect your aesthetic tastes, then turn to the experts at 31-W Insulation. We can install a high-quality garage door that will set your home apart from others in the neighborhood while simultaneously boosting your home’s resale value. Durability – The garage doors we offer are built to last so you can enjoy their look and functionality for many years. Security – The garage doors we install on your home will be composed of heavy-duty materials, such as layered steel, which will help prevent intrusions. Low maintenance – We use the highest quality materials and treatments for our doors so you won’t have to worry about costly maintenance, like painting. 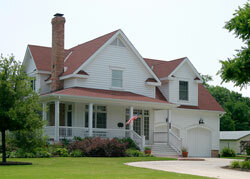 31-W Insulation offers much more than garage door installation. In fact, we can help you with nearly every aspect of a home improvement project by installing products such as custom shelving, fireplaces, shower enclosures, attic insulation, and much more. To get a free estimate on a new garage door for your Bowling Green, KY, home, contact 31-W Insulation today.